Featuring a new 20.3 megapixel APS-C CMOS sensor and DRIMe-IV image processing engine the South Korean manufacturer claims the NX300 delivers improvements in speed, image quality, colour reproduction and noise reduction. The wide 100-25600 ISO range indicates the NX300 should be a great camera for low-light photography – something our DxOMark Sensor Scores will measure as soon as it’s available. For high-speed photography the new hybrid autofocus system offers both Contrast and Phase Detection technology and there’s 9fps continuous shooting and a 1/6000th sec maximum shutter speed. The NX300’s Smart Mode features 14 automatic exposure modes and for video there’s full HD 1920×1080 capture in 2D or 3D. The NX Series also features Samsung’s unique i-Function system for adjusting shooting settings via the lens, which improves handling on these smaller hybrid camera bodies. With no built-in viewfinder images are composed via the LCD screen so thankfully the new 3.3-inch AMOLED display boasts an increased 800x480pixel resolution and 768,000 dots for greater definition. The LCD is also articulated so it can be angled out making composition from awkward positions and video capture at waist-level much easier. The LCD’s touchscreen technology allows photographers to review images just like on a smart phone and even change settings, set the auto focus point and fire the shutter via the screen. First introduced on the NX20 Samsung’s SMART CAMERA technology on the NX300 offers built-in wireless connectivity and a host of features for sharing and backing-up images. Available to download for both Android and iOS platforms Samsung’s SMART CAMERA App will automatically connect the NX300 to your smart phone or tablet whenever they’re on the same WI-FI network. The SMART CAMERA App includes an AutoShare feature to automatically send images to your smart device for safe keeping, Mobile Link for selective transfer of images from the camera, Remote Viewfinder to get a live view feed from the camera on your smart device, Allshare Play for backing up images to the Internet and a DIRECT LINK hot-key for quickly uploading images to social media networks. Announced alongside the NX300 Samsung also unveiled a new 45mm f/1.8 prime lens for their NX lens mount. With an equivalent 69.3mm focal length taking into account the 1.5 times ‘crop factor’ the new 45mm prime offers a wide maximum aperture for low-light photography. It’s also available in two versions including the standard 2D version or the more expensive 3D option that can capture both still and moving images in 3D. 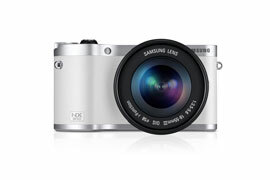 The NX300 is also compatible with Samsung’s entire range of NX lenses and accessories. Launched at CES in January 2013 at the time of writing neither the Samsung NX300 or 45mm f/1.8 lens are currently available to buy however prices are expected to be around $750 for the NX300, $300 for the 2D 45mm f1/8 lens and $500 for the 3D version.